The past few months in the music world have been defined by mega releases (think Carter IV, Watch The Throne, Mylo Xyloto, Take Care, etc). Released after months of speculation and hype, these albums will dominate the charts leading up to Xmas, though their actual qualities vary from "Ehh" to "Not Bad." A very quiet release from a diminutive French-Canadian artist, in my opinion, tops them all. 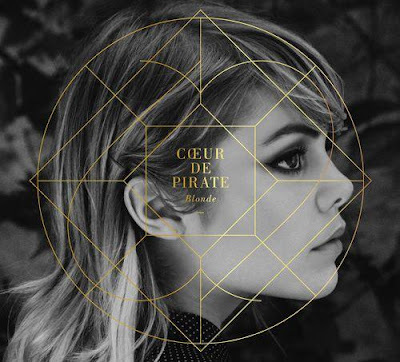 Big personal favorite Coeur de Pirate (real name Beatrice Martin) recently released her second full album entitled Blonde. Martin pulls off something that lots of bands are trying to do these days-capture a sound from a bygone decade. With influences ranging from 1960's French Pop to western ballads, Beatrice seems to distance herself from the mainly mellow piano backed jams of her first, self-titled, album. Though nothing has the instant catchiness of "Comme Des Enfants," Blonde is a more mature, more nuanced album. Playing it the past few days reminded me somehow of a great, focused, soundtrack, much like the ones behind Drive and Amelie. In this case, Blonde sounds like the soundtrack to a simpler era. Though not flashy, bereft of big name producers, and probably not the springboard to a nationwide arena tour, Coeur has stealthily released what I consider to be one of the best album of 2011, so far. Click here to download "Cap Diamant"
Click here to download "Adieu"